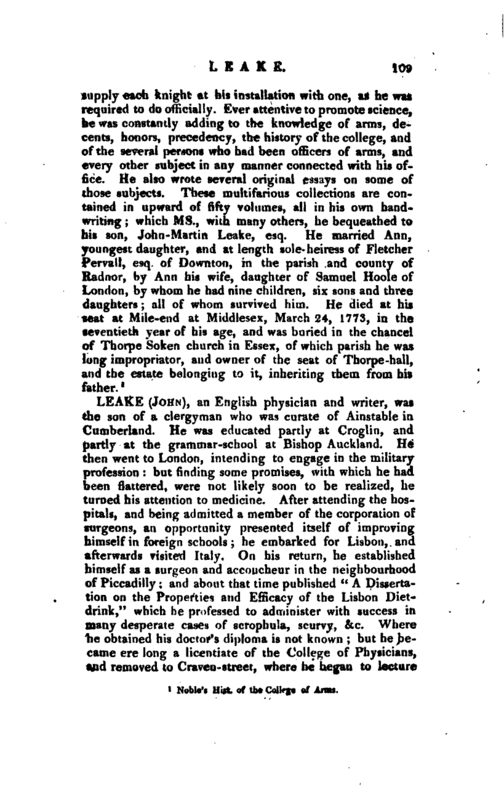 , a herald and antiquary, son of captain Stephen Martin, mentioned in the preceding article, was born April 5, 1702. He was educated at the school of Mr. Michael Maittaire, and was admitted of the Middle-temple. In 1724 he was appointed a deputylieutenant of the Tower-hamlets; in which station he afterwards distinguished himself by his exertions during the rebellion in 1745. On the revival of the order of the Bath in 1725, he was one of the esquires of the earl of Sussex, deputy earl-marshal. He was elected F. A. S. March 2, 1726-7. In the same year he was created Lancaster herald, in the room of Mr. Hesketh; in 1729 constituted Norroy; in 1741 Clarenceux; and by patent dated December 19, 1754, appointed garter. 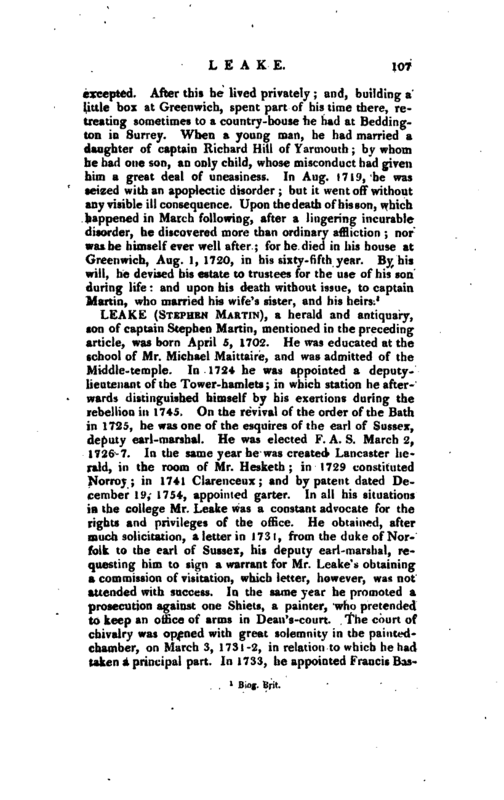 In all his situations in the college Mr. Leake was a constant advocate for the rights and privileges of the office. He obtained, after much solicitation, a letter in 1731, from the duke of Norfolk to the earl of Sussex, his deputy earl -marshal, requesting him to sign a warrant for Mr. Leake’s obtaining a commission of visitation, which letter, however, was not attended with success. In the same year he promoted a prosecution against one Shiets, a painter, who pretended to keep an om’ce of arms in Dean’s-court. The court of chivalry was opened with great solemnity in the paintedchamber, on March 3, 1731-2, in relation to which he had taken a principal part. In 1733, he appointed Francis | Bassano, of Chester, his deputy, as Norroy, for Chester and North Wales; and about the same time asserted his right, as Norroy, to grant arms in North Wales, which right was claimed by Mr. Longville, who had been constituted Gloucester King at Arms partium Walii<t, annexed to that of Bath King at Arms, at the revival of that order. He drew up a petition in January 1737-8, which was presented to the king in council, for a new charter, with the sole power of painting arms, &c. which petition was referred to the attorney and solicitor general; but they making their report favourable to the painters, it did not succeed. 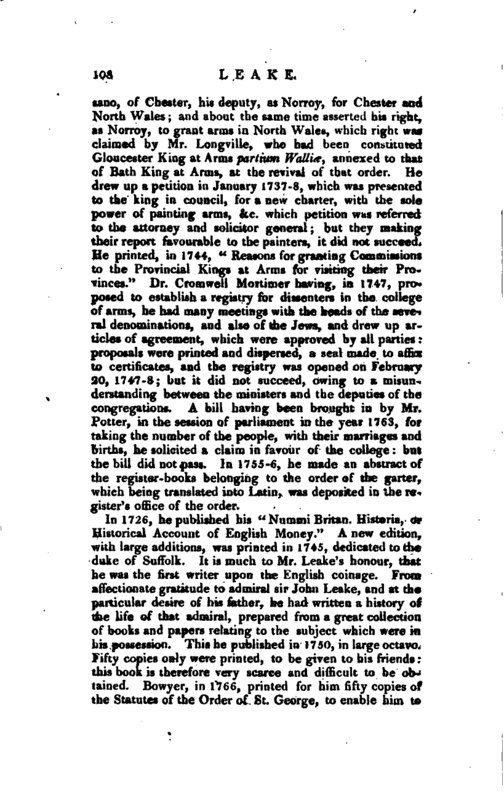 He printed, in 1744, “Reasons for granting Commissions to the Provincial Kings at Arms for visiting their Provinces.” Dr. Cromwell Mortimer having, in 1747, proposed to establish a registry for dissenters in the college of arms, he had many meetings with the heads of the several denominations, and also of the Jews, and drew up articles of agreement, which were approved by all parties: proposals were printed and dispersed, a seal made to affix to certificates, and the registry was opened on February 20, 1747-8; but it did not succeed, owing to a misunderstanding between the ministers and the deputies of the congregations. A bill having been brought in by Mr. Potter, in the session of parliament in the year 1763, for taking the number of the people, with their marriages and births, he solicited a claim in favour of the college: but the bill did not pass. In 1755-6, he made an abstract of the register- books belonging to the order of the garter, which being translated into Latin, was deposited in the register’s office of the order. Noble’s’ Hist, of the College of Arms.